A great—and free!—way to spend a delightful and informative hour or two while in the City of Light is to visit the one-time home of one of the most famous of all Parisians: artist, poet and author Victor Hugo. Hugo lived in a 17th century mansion overlooking the gorgeous Place des Vosges in the Marais for 16 years, from 1832 to 1848. In fact, it was at his second-floor apartment in this very house that Hugo penned one of his most famous works, the novel Les Miserables. Today, the writer’s former apartment at 6 Place des Vosges is a free museum called Maison de Victor Hugo (one of 14 free City of Paris museums operated by the public organization Paris Musees) and includes four carefully reconstructed rooms, many filled with artifacts owned or used by Hugo himself, including an antechamber, a Chinese-inspired living room, a medieval dining room, and the bedroom where Hugo passed away in 1885. 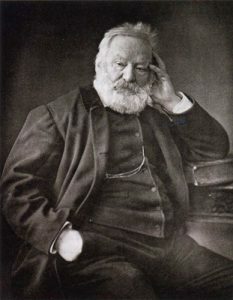 Hugo is considered one of France’s greatest writers and is certainly one of the most celebrated novelists in the world. 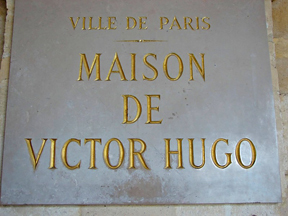 Although many French citizens know Hugo for his more than 4,000 drawings and his collections of poetry—Les Contemplations and La Legende des Siecles—the writer is most famous for two novels: Les Miserables, which serves as the foundation for the world’s most popular musical play and an Academy Award-winning film; and Notre-Dame de Paris, known in English as The Hunchback of Notre Dame. The latter, published in 1831, is credited with literally saving Notre Dame Cathedral from destruction. At the time, there was a general disdain for medieval Gothic architecture among France’s elite and little to no interest in Notre Dame as a historic or cultural landmark. The crown jewel of Gothic cathedrals had deteriorated badly over the centuries and was in danger or being torn down to make way for newer, more modern buildings or of being irreparably changed with modern “improvements” (already, the church’s famed stained-glass had been replaced by modern clear windows to allow more sunlight to enter the church). Hugo’s enormously popular novel is credited with sparking renewed general interest in Paris’s medieval history and in Notre Dame Cathedral specifically. The novel ultimately paved the way for major renovations at Notre Dame that preserved its Gothic architecture for future generations of Parisians and lovers of the City of Light to enjoy—and, thankfully, a restoration of the Cathedral’s magnificent stained glass, including its acclaimed north and south Rose Windows. Maison de Victor Hugo is open Sunday and Tuesday-Saturday (closed Monday) from 10 a.m. to 6 p.m. 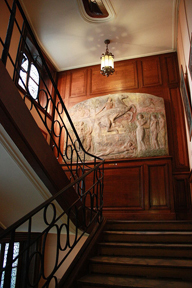 The museum is most easily reached via the Saint-Paul or CheminVert Metro stations in the Marais district. Admission to Maison de Victor Hugo is free, but it should be noted that other floors of the mansion house other temporary art exhibits, and admission to these salons requires an admission fee. This entry was posted in Beauty of Paris, Famous Paris destinations, French culture, French history, History of Paris, Literature, Marais, Museums, Right Bank, Writers and tagged Les Miserables, Maison de Victor Hugo, Notre Dame, Place des Vosges, The Hunchback of Notre Dame by Bob Adams. Bookmark the permalink.